Graded VG-EX 4 by PSA. Outstanding example of Hall of Famer Nap Lajoie from the E96 Philadelphia Caramel series. E96 cards are very similar in design to their E95 counterparts and can most easily be distinguished by the attractive red-printed checklist of the complete set on the reverse of each card. They were issued on fairly thin stock that did not easily escape damage or wear well over the years. 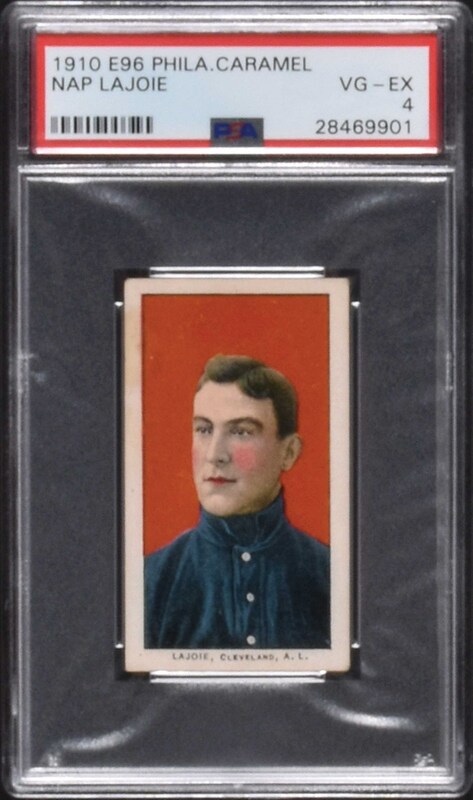 Nap Lajoie is one of eight Hall of Famers featured in the E96 set and is portrayed in a portrait pose set against a bold red background. This card is bright and crisp, with light wear on the corners, flawless registration, and virtually perfect centering. The reverse features a very boldly printed checklist for the set. 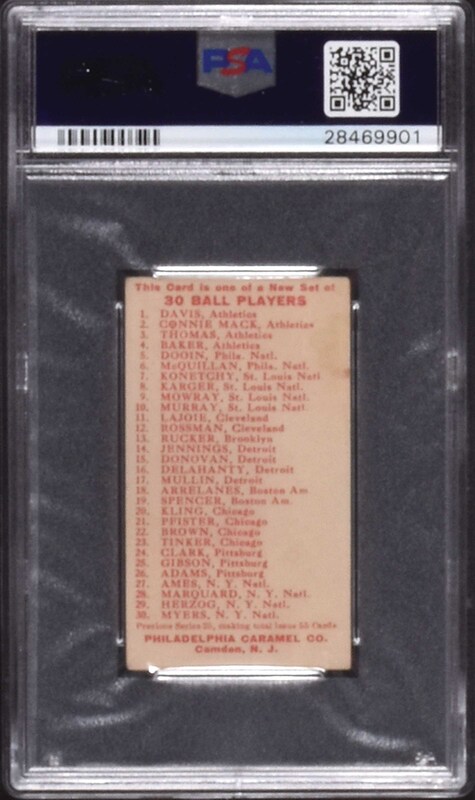 This card is in outstanding condition, especially for a caramel card, which, because they were issued with candy, one card per package, tend to survive in lesser condition than their more common tobacco-card counterparts. This is a superb example of one of Lajoie’s most striking cards from one of the most popular and colorful of all “E” card issues, and one that would be a worthy addition to any extremely high quality classic Hall of Fame, E96, or sample-card collection. Reserve $300. Estimate $500+.